American intercontinental ballistic missile. Final operational version of Atlas ICBM. Differed in guidance systems. Deployed as missiles from 1961 to 1966. After retirement, the ICBM's were refurbished and used for over thirty years as space launch vehicles. Status: Retired 1981. First Launch: 1961-08-09. Last Launch: 1981-06-23. Number: 69 . Payload: 820 kg (1,800 lb). Thrust: 1,713.80 kN (385,278 lbf). Gross mass: 121,980 kg (268,910 lb). Height: 24.00 m (78.00 ft). Diameter: 3.05 m (10.00 ft). Apogee: 185 km (114 mi). LEO Payload: 820 kg (1,800 lb) to a 185 km orbit at 90.00 degrees. Launch Price $: 50.000 million in 1985 dollars. Flyaway Unit Cost 1985$: 11.000 million in 1994 dollars. Initial Operational Capability: 1961. Stage 0. 1 x Atlas MA-3. Gross Mass: 3,174 kg (6,997 lb). Empty Mass: 3,174 kg (6,997 lb). Thrust (vac): 1,644.960 kN (369,802 lbf). Isp: 290 sec. Burn time: 120 sec. Isp(sl): 256 sec. Diameter: 4.90 m (16.00 ft). Span: 4.90 m (16.00 ft).Propellants: Lox/Kerosene. No Engines: 2. Engine: LR-89-5. Status: In Production. Stage 1. 1 x Atlas E/F. Gross Mass: 117,826 kg (259,761 lb). Empty Mass: 4,926 kg (10,859 lb). Thrust (vac): 386.300 kN (86,844 lbf). Isp: 316 sec. Burn time: 309 sec. Isp(sl): 214 sec. Diameter: 3.05 m (10.00 ft). Span: 4.90 m (16.00 ft). Length: 20.12 m (66.01 ft). Propellants: Lox/Kerosene. No Engines: 1. Engine: LR-105-5. Status: In Production. Because even the dispersed storage and semi-buried coffins of the Atlas E offered insufficient protection, the USAF decided already in 1959 to deploy Atlas missiles in underground silos, just like the HGM-25A Titan I. This resulted in the SM-65F Atlas F missile, which was essentially an SM-65E with a modified fueling system to accomodate the new silo launcher. The first silo-stored Atlas F squadron became operational in November 1962. Because the SM-65F could be fueled while still in the silo, launch survivability was much improved. After fueling, it took only two minutes to raise and launch the missile. In a crisis, it was even possible to store the SM-65F fully fueled in the silo for some length of time, which lead to a reaction time of only five minutes. However, fueling in the silo was even more dangerous than in the open, and four Atlas Fs violently exploded during this operation, destroying their silos. There are also sources which claim that the SM-65Ds based on unprotected pads at Vandenberg AFB were redesignated as PGM-16D. While this would be logical, the PGM-16D designation was apparently never officially allocated. Also, reports claiming that XPGM-16A, XPGM-16B, and XPGM-16C were the new designations for XSM-65A, XSM-65B, and XSM-65C, respectively, are in error, because all three development models had long been expended by 1963. While the 1963 redesignations did include some "paper" designations of retired or cancelled missiles, this was not true for the Atlas series. After the LGM-30 Minuteman had become operational in early 1963, the Atlas became rapidly obsolete. By October 1964, all Atlas D missiles had been phased out, followed by the Atlas E-F in April 1965. About 350 Atlas ICBMs of all versions were built, with a peak deployment level of 129 (30 D, 27 E, 72 F). The Atlas was used as a space launch vehicle since the very beginning of the program, and Atlas developments are still used in this role in the 21st century. Converted ICBMs and early purpose-built space launchers, usually with additional upper stages, were used by the USAF under the basic SLV-3 designator. In 1990, the Atlas E, Atlas II and Atlas IIA-AS vehicles received the official military designations SB-1A, SB-2A and SB-2B, respectively. Current prime contractor for all Atlas rockets is Lockheed-Martin. The vehicles converted for space launch use and launched from Vandenberg AFB used a radio guidance system that was based on a modification of the General Electric Radio Tracking System (GERTS), originally employed on the Atlas D. In fact, the GERTS guidance used for space launch employed one of the original radar stations used for the Atlas D and even used some actual Atlas D components in its Pulse Beacon Decoder, the vehicle's X-band radio transponder. Newer solid state computers were used to run the guidance software and were interfaced with the radar; eventually they were made redundant, although with a human operator charged with detecting failure. The large Bosch-Arma pod on the side of the Atlas E and F space boosters launched from Vandenberg AFB from the mid-70's to the mid-90's was in fact empty. It was not removed and replaced with a more streamlined fairing since that would have cost money and gained no significant performance. So, the Atlas E and F space boosters used Atlas E and F ICBM airframes and engines with the tanks modified with a new payload interface section, a mixture of Atlas E and F components (selected based on which designs were most suitable for the space launch mission) and a modified Atlas D radio guidance system. GERTS was a complex, glitch-prone system, its only saving graces being that it was both the cheapest guidance system around and the most reliable, operating for almost 30 years without one flight failure and at a per-flight cost an order of magnitude below that of an inertial guidance system. Prior to Apollo-Saturn, all U.S. manned orbital flights used GERTS, both on the Mercury-Atlas D and the Gemini-Titan II missions. The proper way to refer to the space booster Atlas E's and F's was "Atlas E-F Space Booster," because of the mix of configuration features. Of course, individually the boosters were referred to by their "Tail Numbers" such as 19F, 76E, 68E, etc. The total launched cost of an Atlas E-F space booster was about $15M - or less than 1-3 the cost of a Titan II space booster, and less than 1-20th what was finally admitted as the cost of a single Space Shuttle mission. About 35 unmodified Atlas E-F missiles in storage at Norton AFB were scrapped in the early 1970's. The Space Shuttle was coming and it was assumed that they were not needed. The cost of maintaining them in storage was "horrendous" - about $2000 each per year. At least a half billion dollars worth of perfectly usable, incredibly cheap space boosters (equivalent to a couple of billon dollars in replacement costs) were run over with a bulldozer in order to save perhaps one million dollars in storage costs overtwenty years . The Air Force officer who recommended this travesty of planning received a medal for his farsightedness. Family: ICBM. Country: USA. Engines: LR105-5, LR89-5. Spacecraft: TIROS, Calsphere, OV1, LCS, OV5, Orbiscal, RADCAT, RM, Boost Glide Re-entry Vehicle, Cannonball, Gridsphere, Musketball, Mylar, Rigidsphere, NOSS, Radsat, NTS, P 72, NOSS-Subsat, GPS Block 1, Seasat, Tiros N, Solwind. Projects: Navstar. Launch Sites: Cape Canaveral, Vandenberg, Cape Canaveral LC11, Cape Canaveral LC13, Vandenberg 576A2, Vandenberg 576A3, Vandenberg SLC3W, Altus AFB, Vandenberg 576E, Vandenberg OSTF2, Schilling AFB, Lincoln AFB, Vandenberg 576A1, Dyess AFB, Walker AFB, Plattsburgh AFB, Vandenberg 576D, Walker AFB Site 579, Altus AFB 577-6. Stages: Atlas E/F, Atlas MA-3. Agency: Convair. 1960 Apr - . LV Family: Atlas. Launch Vehicle: Atlas F.
Atlas squadrons 8 through 13 to have 12 launchers each. - . Headquarters USAF approved a 1 x 12 configuration for Atlas squadrons 8 through 13 - each squadron would have 12 individual launch facilities..
1960 April 6 - . LV Family: Atlas. Launch Vehicle: Atlas E, Atlas F.
Atlas E/F silo-based squadrons increased by one silo each. - . Atlas E/F silo-lift strategic missile squadrons were enlarged from 9-12 launchers to 10-13 each. In these units, the Atlas missiles would be maintained in hardened underground silos..
1960 July 15 - . Launch Site: , Vandenberg. LV Family: Atlas. Launch Vehicle: Atlas F.
Atlas F squadron 576A activated at Vandenberg AFB. - . The 576A Strategic Missile Squadron (Atlas F) was activated at Vandenberg AFB and assigned to SAC's First Missile Division..
1961 August 9 - . 04:31 GMT - . Launch Site: Cape Canaveral. Launch Complex: Cape Canaveral LC13. LV Family: Atlas. Launch Vehicle: Atlas F.
Research and development test - . Nation: USA. Agency: USAF. Apogee: 1,400 km (800 mi). The first Series F Atlas missile (2F) was successfully launched from Complex 13 at Cape Canaveral and completed its test flight. First F flight, at AMR), successful. 1961 November 22 - . 21:04 GMT - . Launch Site: Cape Canaveral. Launch Complex: Cape Canaveral LC11. LV Family: Atlas. Launch Vehicle: Atlas F.
Research and development test - . Nation: USA. Agency: USAF. Apogee: 1,400 km (800 mi). Pod 3, 22 test / ionosphere / aeronomy mission. 1961 December 12 - . 20:16 GMT - . Launch Site: Cape Canaveral. Launch Complex: Cape Canaveral LC11. LV Family: Atlas. Launch Vehicle: Atlas F. FAILURE: Failure. Failed Stage: 1. Research and development / Pod 24 test - . Nation: USA. Agency: USAF. Apogee: 1,000 km (600 mi). 1961 December 21 - . 03:35 GMT - . Launch Site: Cape Canaveral. Launch Complex: Cape Canaveral LC11. LV Family: Atlas. Launch Vehicle: Atlas F. FAILURE: Failure. Failed Stage: 1. Research and development test - . Nation: USA. Agency: USAF. Apogee: 500 km (310 mi). Pod 15, 25 chemical release / ionosphere / meteorite mission. 1962 April - . LV Family: Atlas. Launch Vehicle: Atlas F.
Atlas F training facility activated. - . Nation: USA. VAFB Atlas F training facility turned over to SAC. 1962 April 9 - . 20:50 GMT - . Launch Site: Cape Canaveral. Launch Complex: Cape Canaveral LC11. LV Family: Atlas. Launch Vehicle: Atlas F. FAILURE: Failure. Failed Stage: 1. 1962 August 1 - . 21:07 GMT - . Launch Site: Vandenberg. Launch Complex: Vandenberg 576E. LV Family: Atlas. Launch Vehicle: Atlas F.
Research and development test - . Nation: USA. Agency: USAF. Apogee: 1,400 km (800 mi). The first Atlas F missile (15F) was launched from Vandenberg on an operational test flight. First successful Atlas F flight at operational site, SMS 576E (15F). 1962 August 10 - . 21:11 GMT - . Launch Site: Vandenberg. Launch Complex: Vandenberg OSTF2. LV Family: Atlas. Launch Vehicle: Atlas F. FAILURE: Failure. Failed Stage: 1. Research and development launch - . Nation: USA. Agency: USAF. Apogee: 10 km (6 mi). 1962 August 13 - . 22:00 GMT - . Launch Site: Cape Canaveral. Launch Complex: Cape Canaveral LC11. LV Family: Atlas. Launch Vehicle: Atlas F.
Research and development / Pod 16 test - . Nation: USA. Agency: USAF. Apogee: 1,400 km (800 mi). 1962 September - . Launch Site: Schilling AFB. Launch Complex: Schilling AFB. LV Family: Atlas. Launch Vehicle: Atlas F.
Atlas SMS 560 operational. - . Nation: USA. Schilling AFB SMS 550 operational. 1962 September 7 - . Launch Site: Schilling AFB. LV Family: Atlas. Launch Vehicle: Atlas F.
The first Atlas F (HGM-16AF) missile squadron, the 550th Strategic Missile Squadron at Schilling AFB, Kansas, was turned over to SAC. - . The first Atlas F (HGM-16AF) missile squadron, the 550th Strategic Missile Squadron at Schilling AFB, Kansas, was turned over to SAC. This was the first Atlas unit to feature the silo-lift storage/launcher configuration for improved hardness and survivability. 1962 September 15 - . Launch Site: Lincoln AFB. LV Family: Atlas. Launch Vehicle: Atlas F.
The second silo-lift Atlas F squadron turned over to SAC. - . The second silo-lift Atlas F squadron, the 551st Strategic Missile Squadron at Lincoln AFB, Nebraska, was turned over to SAC..
1962 September 15 - . Launch Site: Lincoln AFB. Launch Complex: Lincoln AFB. LV Family: Atlas. Launch Vehicle: Atlas F.
Atlas SMS 551 operational. - . Nation: USA. Lincoln AFB SMS 551 operational. 1962 September 19 - . 19:30 GMT - . Launch Site: Cape Canaveral. Launch Complex: Cape Canaveral LC11. LV Family: Atlas. Launch Vehicle: Atlas F.
Research and development / Pod 17 test - . Nation: USA. Agency: USAF. Apogee: 1,400 km (800 mi). Atlas 8F, the seventh Series F R&D missile, was the 100th to be launched from Cape Canaveral since the first abortive launch on 11 June 1957 and the 145th Atlas to be launched from both Cape Canaveral and Vandenberg. .
1962 October 9 - . Launch Site: Altus AFB. LV Family: Atlas. Launch Vehicle: Atlas F.
Third Atlas F squadron turned over to SAC at Altus AFB. - . The 577th Strategic Missile Squadron at Altus AFB, Oklahoma, was the third Atlas F squadron turned over to SAC by Ballistic Systems Division site activation task forces (SATAFs)..
1962 October 9 - . Launch Site: Altus AFB. Launch Complex: Altus AFB. LV Family: Atlas. Launch Vehicle: Atlas F.
Atlas SMS 577 operational. - . Nation: USA. Altus AFB SMS 577 operational. 1962 October 19 - . 18:15 GMT - . Launch Site: Cape Canaveral. Launch Complex: Cape Canaveral LC11. LV Family: Atlas. Launch Vehicle: Atlas F.
Research and development launch - . Nation: USA. Agency: USAF AFSC. Apogee: 1,400 km (800 mi). 1962 November 4 - . Launch Site: Dyess AFB. LV Family: Atlas. Launch Vehicle: Atlas F.
Atlas F missile squadron turned over to SAC. - . The Atlas F missile squadron located at Dyess AFB, Texas - the 578th Strategic Missile Squadron - was turned over to SAC..
1962 November 7 - . 19:43 GMT - . Launch Site: Cape Canaveral. Launch Complex: Cape Canaveral LC11. LV Family: Atlas. Launch Vehicle: Atlas F.
1962 November 14 - . 22:36 GMT - . Launch Site: Vandenberg. Launch Complex: Vandenberg OSTF2. LV Family: Atlas. Launch Vehicle: Atlas F. FAILURE: Failure. Failed Stage: 1. Research and development launch - . Nation: USA. Agency: USAF AFSC. Apogee: 300 km (180 mi). 1962 November 15 - . Launch Site: Dyess AFB. Launch Complex: Dyess AFB. LV Family: Atlas. Launch Vehicle: Atlas F.
Atlas SMS 578 operational. - . Nation: USA. Dyess AFB SMS 578 operational. 1962 November 30 - . Launch Site: Walker AFB. Launch Complex: Walker AFB. LV Family: Atlas. Launch Vehicle: Atlas F.
Atlas SMS 579 operational. - . Nation: USA. Walker AFB SMS 579 operational. 1962 November 30 - . Launch Site: Walker AFB. LV Family: Atlas. Launch Vehicle: Atlas F.
The Atlas F silo-lift squadron at Walker AFB turned over to SAC - . The Atlas F silo-lift squadron at Walker AFB, New Mexico, was turned over to SAC (579th SMS) and was declared fully operational 8 December..
1962 December 5 - . 21:25 GMT - . Launch Site: Cape Canaveral. Launch Complex: Cape Canaveral LC11. LV Family: Atlas. Launch Vehicle: Atlas F.
Research and development test - . Nation: USA. Agency: USAF AFSC. Apogee: 1,400 km (800 mi). The final Atlas F research and development flight test missile (21F) was launched down the Atlantic Missile Range. Ten missiles were launched in this series - seven were successes and three failures. The launch of Atlas 21F brought flight testing of Atlas operational missiles from Cape Canaveral to an end after almost five and one-half years. Since the first R&D Atlas was launched on 11 June 1957, 83 Atlas Series A through F missiles had been fired from the Cape - 52 of them successes or partials and 31 failures. Last Atlas F R&D flight. 1962 December 20 - . Launch Site: Plattsburgh AFB. Launch Complex: Plattsburgh AFB. LV Family: Atlas. Launch Vehicle: Atlas F.
Atlas SMS 556 - last Atlas squadron - operational. - . Nation: USA. Plattsburgh AFB SMS 556 (last Atlas squadron) operational. 1963 March 16 - . 02:05 GMT - . Launch Site: Vandenberg. Launch Complex: Vandenberg 576D. LV Family: Atlas. Launch Vehicle: Atlas F.
OT TALL TREE 5 operational test launch - . Nation: USA. Agency: USAF SAC. Apogee: 1,400 km (800 mi). 1963 March 21 - . 21:10 GMT - . Launch Site: Vandenberg. Launch Complex: Vandenberg OSTF2. LV Family: Atlas. Launch Vehicle: Atlas F.
1963 March 24 - . 00:29 GMT - . Launch Site: Vandenberg. Launch Complex: Vandenberg 576E. LV Family: Atlas. Launch Vehicle: Atlas F. FAILURE: Failure. Failed Stage: 1. OT TALL TREE 4 operational test launch - . Nation: USA. Agency: USAF SAC. Apogee: 10 km (6 mi). 1963 June 1 - . LV Family: Atlas. Launch Vehicle: Atlas F.
Atlas F propellant loading accident. - . Nation: USA. Exploded during propellant loading (Walker AFB 1). 1963 June 2 - . 00:26 GMT - . Launch Site: Walker AFB. Launch Complex: Walker AFB. Launch Pad: Walker AFB Missile Site 579. LV Family: Atlas. Launch Vehicle: Atlas F.
Nation: USA. Agency: USAF. Apogee: 0 km (0 mi). 1963 October 4 - . 05:17 GMT - . Launch Site: Vandenberg. Launch Complex: Vandenberg OSTF2. LV Family: Atlas. Launch Vehicle: Atlas F. FAILURE: Failure. Failed Stage: 1. 1963 December 18 - . 22:56 GMT - . Launch Site: Vandenberg. Launch Complex: Vandenberg OSTF2. LV Family: Atlas. Launch Vehicle: Atlas F.
1964 January 6 - . LV Family: Atlas. Launch Vehicle: Atlas F.
Update program for Atlas F begun - . The update program for the Atlas F missile sites began on schedule..
1964 February 1 - . LV Family: Atlas. Launch Vehicle: Atlas F.
Atlas F missile responisibility transferred to AFLC. - . Ballistic Systems Division transferred system and engineering responsibility for the Atlas F missile to AFLC's San Bernardino Air Materiel Area (SBAMA), Norton AFB, Califoria..
1964 February 13 - . 18:11 GMT - . Launch Site: Walker AFB. Launch Complex: Walker AFB. Launch Pad: Walker AFB Missile Site 579. LV Family: Atlas. Launch Vehicle: Atlas F. FAILURE: Exploded during propellant loading.. Accident - . Nation: USA. Agency: USAF. Apogee: 0 km (0 mi). Operational ICBM test at Walker AFB..
1964 March 9 - . 21:54 GMT - . Launch Site: Walker AFB. Launch Complex: Walker AFB. Launch Pad: Walker AFB Missile Site 579. LV Family: Atlas. Launch Vehicle: Atlas F. FAILURE: Exploded during propellant loading..
1964 April 3 - . 20:26 GMT - . Launch Site: Vandenberg. Launch Complex: Vandenberg OSTF2. LV Family: Atlas. Launch Vehicle: Atlas F. FAILURE: Failure. Failed Stage: 1. Demonstration and shakedown operations launch - . Nation: USA. Agency: USAF SAC. Apogee: 0 km (0 mi). 1964 May 14 - . Launch Site: Altus AFB. Launch Complex: Altus AFB 577-6. LV Family: Atlas. Launch Vehicle: Atlas F. FAILURE: Exploded during propellant loading.. Accident - . Nation: USA. Agency: USAF. Apogee: 0 km (0 mi). Operational missile test at Altus AFB..
1964 August 7 - . 20:12 GMT - . Launch Site: Vandenberg. Launch Complex: Vandenberg 576E. LV Family: Atlas. Launch Vehicle: Atlas F.
Demonstration and shakedown operations launch - . Nation: USA. Agency: USAF SAC. Apogee: 1,400 km (800 mi). 1964 August 31 - . 15:46 GMT - . Launch Site: Vandenberg. Launch Complex: Vandenberg 576D. LV Family: Atlas. Launch Vehicle: Atlas F.
1964 November 21 - . LV Family: Atlas. Launch Vehicle: Atlas F.
Phase out of the Atlas F from the operational force by June 1965. - . Headquarters USAF issued Atlas System Program Directive 107A-65-1 announcing the scheduled phase out of the Atlas F from the operational force by the end of FY1965 (30 June 1965)..
1964 December 22 - . 19:15 GMT - . Launch Site: Vandenberg. Launch Complex: Vandenberg 576E. LV Family: Atlas. Launch Vehicle: Atlas F.
ST - . Nation: USA. Agency: USAF SAC. Apogee: 1,400 km (800 mi). 1965 January 8 - . 18:59 GMT - . Launch Site: Vandenberg. Launch Complex: Vandenberg OSTF2. LV Family: Atlas. Launch Vehicle: Atlas F.
Atlas 106F concluded SAC's Atlas F operational test launch program from Vandenberg AFB that had begun on 9 September 1959. During the series, 51 Atlas missiles were launched by SAC crews to verify the operational missiles, with 30 of them ruled successes. 1965 April 20 - . Launch Site: Lincoln AFB. LV Family: Atlas. Launch Vehicle: Atlas F.
Final Atlas F missile departed for retirement and storage. - . The final Atlas F missile departed Lincoln AFB, Nebraska (551st Strategic Missile Squadron), for retirement and storage..
1965 September 15 - . Launch Site: Atlas F.
Burner II announ ced. - . Major General Ben I. Funk, Space Systems Division commander, announced the development of a new, low-cost space upper stage called Burner II. 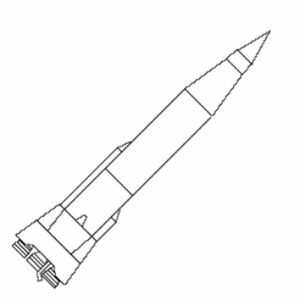 Adaptable for use with almost all Air Force standard launch vehicles, the Burner II would be to orbit small and medium-sized payloads. When completed, the Burner II would be the smallest maneuverable upper stage in the Air Force space vehicle inventory. 1966 April - . LV Family: Atlas. Launch Vehicle: Atlas F.
Final active Atlas squadron deactivated. - . Nation: USA. VAFB SMS 576 deactivated. 1966 April 15 - . Launch Site: Atlas F.
Test firing of the Burner II solid rocket motor. - . The Thiokol Chemical Corporation successfully test fired the Burner II solid rocket motor..
1969 Jun - . Launch Site: Atlas F.
Burner IIA solid-propellant upper stage begun. - . SAMSO began development of the Burner IIA solid-propellant second-stage vehicle that would provide a tandem motor injection stage and on-orbit capability nearly twice that of the existing Burner II..
1975 December 18 - . Launch Site: , Vandenberg. LV Family: Atlas. Launch Vehicle: Atlas F.
Funding for the activation of SLC-3E - . Congress approved funding for the activation of SLC-3E, Vandenberg AFB, and its conversion to an Atlas F configuration..
1976 Mar - . Launch Site: , Vandenberg. LV Family: Atlas. Launch Vehicle: Atlas F.
Construction began on SLC-3E, Vandenberg - . Construction began on the activation of SLC-3E, Vandenberg AFB, and its conversion to an Atlas F configuration..
1977 Mar - . Launch Site: , Vandenberg. LV Family: Atlas. Launch Vehicle: Atlas F.
Space Launch Complex 3 East completed. - . The task of activating Space Launch Complex 3 East, Vandenberg AFB, and converting it to an Atlas F configuration was completed..
1978 December 12 - . LV Family: Atlas. Launch Vehicle: Atlas F.
More powerful upper stage for GPS satellites. - . Spacecraft: Navstar. SAMSO released a draft RFP for a more powerful stage vehicle to be used on the Atlas F in launching GPS satellites..
1985 February 6 - . Launch Site: Vandenberg. Launch Complex: Vandenberg. LV Family: Atlas. Launch Vehicle: Atlas F.
USAF - . Nation: USA.